AzhwAr says in this pAsuram that to enjoy emperumAn, do as mentioned in the previous pAsuram. 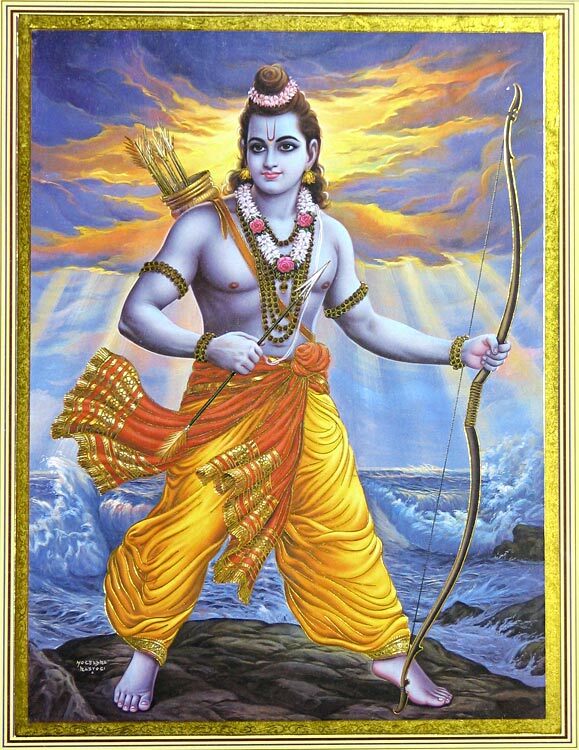 In order to get rid of the sins which are hurdles to this experience, approach SrI rAma, the son of emperor dhaSaratha. adaindha aruvinai – these are entities [sins] which came in between [and not part of the soul as its nature]. AthmA (soul) is the epitome of knowledge and happiness; it is unchanging. Since these sins have been following the soul for a long time, it would appear as if these are also a part of soul. Souls are such that they do not allow lowly entities such as sins to stick to them; hence these are called vandhERi (something which came in between). Even though paramAthmA (supreme entity) also dwells within the AthmA, these sins will not affect him. midaindhavai – all of these aforementioned aspects encircle the soul such that it cannot manifest its true nature. Just as the worm samithaiyidAmANi (silkworm) and spider create webs around them so tightly that they themselves cannot extricate from such webs, these sins also encircle the soul tightly. However, since these are not part of the soul, it is possible to get rid of the aforementioned entities. mINdu ozhiya vENdil – in order to extricate from them. This is similar to making a snake which is chasing a person to turn back and escape. AzhwAr says further that that one has to surrender to emperumAn in order to get rid of these entities, just as emperumAn himself said in SrI bhagavath gIthA 18-66 “mAm Ekam SaraNam vraja – sarva pApEbhyO mOkshayishyAmi ” (surrender only to me. I shall rid you of all your sins). If these are not to trouble oneself again, one has to take the help of the omnipotent emperumAn, just as connection with the royal clan (in those days) would ensure total security for a person. nudangu idaiyai mun ilangai vaiththAn – rAvaNa imprisoned sIthAppirAtti who is always inseparable from emperumAn and who has a slender waist. Just as one breaks a single entity into two, rAvaNa separated SrI rAma and sIthAppirAtti. mun oru nAl than vil angai vaiththAn – he who once kept his beautiful hand on his bow, is the appropriate entity to surrender to. Alternatively, it can be considered that AzhwAr is saying that he attained such an entity. emperumAn takes several attempts to protect us. All that is required is to have firm faith in him. Just as sIthAppirAtti said in SrI rAmAyaNam yudhdha kANdam 30-30 “Saraisthu sankulAm kruthvA lankAm parabalAthdhana:, mAm nayEdhyadhi kAkuthstha: thath thasya sadhruSam bhavEth” (it will be appropriate for SrI rAma, who is capable of annihilating enemies, to agitate lankA with his arrows and redeem me), we have to trust his sharp arrows. If we do this, he will also carry out deeds with affection towards us just as he did towards sIthAppirAtti. Only if sIthAppirAtti showers arrows and protects herself does AthmA too needs to carry out one deed. (In other words, just as sIthAppirAtti did not make any attempt to protect herself, the AthmA also should not attempt to carry out any deed). pirAtti herself would take the role of purushakArabhUthai (recommendatory role) and enable us to attain our desires. Those who think that the AthmA is theirs will suffer the fate of rAvaNa who tried to make his own, the property of emperumAn. The sangathi [connection] between the earlier pAsurams and this pAsuram is that in the earlier pAsurams AzhwAr mercifully told us to worship emperumAn , recite his divine names , meditate on him  etc. In this pAsuram, he tells us that these are not the means to attain him and that emperumAn himself is the means. Whatever he had mentioned in the earlier pAsurams are descriptive of the characteristics of the jIvAthmA, similar to the ones mentioned in the three shatkam (group of 6 chapters) in SrI bhagavath gIthA, viz. explaining the means such as karma, gyAna and bhkthi yOgams (the paths of deeds, knowledge and devotion respectively). What he has mentioned in this pAsuram is the divine instruction of emperumAn in SrI bhagavath gIthA 18-66 when he says that whatever he had mentioned earlier in the gIthA are not the means but that he himself is the means to attain him. The day the jIvAthmA realises his true nature, he would know that there is no means other than emperumAn. This is the essence of this pAsuram and this is the essence of this prabandham. Let us move on to the 60th pAsuram. This entry was posted in iyaRpA, mudhal thiruvandhAdhi on August 8, 2017 by T N Krishnan.